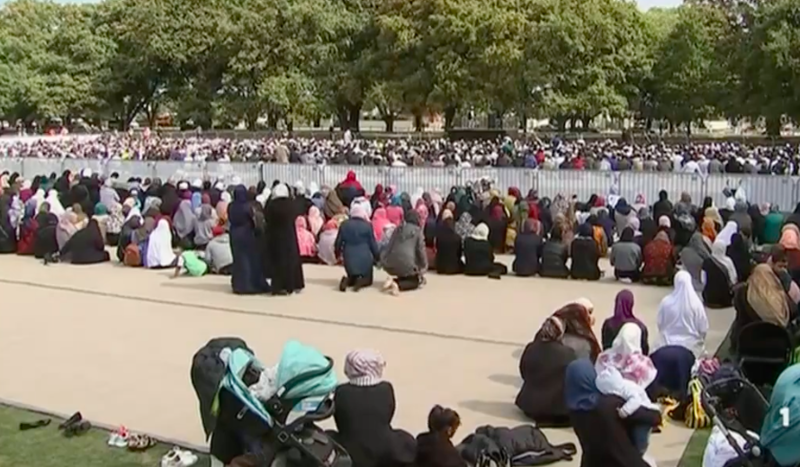 Christchurch—To honour the memory of the victims of the shootings in two mosques on March 15, thousands gathered for the Muslim call to Prayer for the Friday congregational prayer, the Jumu’ah, which was broadcast at 1:30 pm. It was followed by two minutes of silence to honor the 50 people killed in the horrific attack. The service was broadcast all over the nation on TV, radio stations, and through online streaming. A link to the live-sreaming can be found here. Two minutes of silence was observed at Hagley Park, opposite the Masjid Al Noor, one of the mosques where the attacks took place. 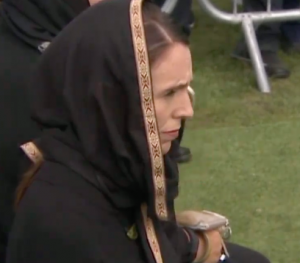 The ceremony was attended by New Zealand’s Prime Minister Jacinda Ardern, community leaders, and visiting foreign dignitaries, who had been invited by the Muslim community to participate in the official proceedings. The Prime Minister addressed the crowd in Arabic when she arrived, saying, “According to the prophet Mohammed… The believers in their mutual kindness, compassion and sympathy are just like one body. When any part of the body suffers, the whole body feels pain. New Zealand mourns with you, we are one”. 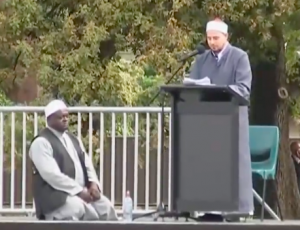 Imam Gamal Fouda of Al Noor mosque had powerful words for the crowd who had gathered. “Brothers and sisters in Islam, brothers and sisters in humanity, brothers and sisters in New Zealand. Last Friday I stood in this mosque and saw hatred and rage in the eyes of the terrorist, who killed and martyred 50 people, wounded 42 and broke the hearts of millions around the world. Of the slain from last week’s attack, the Imam said, “Our loss of you is a gain to New Zealand’s unity and strength. Your departure is an awakening not just for our nation but for all humanity. Your martyrdom is a new life for New Zealand and a chance of prosperity for many. The Imam also addressed Islamophobia, saying, “Islamaphobia kills. We call upon governments around the world, including New Zealand and neighbouring countries to bring an end to hate speech and the politics of fear. The martyrdom of 50 people and the injury of 42 did not come overnight, it was the result of the anti-Muslim rhetoric of some political leaders, media agencies and others. Security was highly visible at the call to prayer, with on-ground policemen and even helicopters hovering overhead. But observers called their presence reassuring and not threatening. 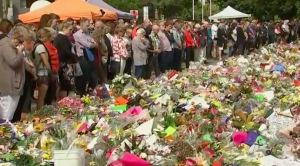 A Muslim leader ended the memorial in the language of New Zealand’s indigenous people, te reo Maori. “Aroha, Aroha, Aroha” he said, which means, “Love, love, love”. Meanwhile, in Singapore, the New Zealand High Commission Singapore thanked Foreign Affairs Minister Dr Vivian Balakrishnan for having visited and signed the condolence book for the victims of the terrorist attack.